Bisht/Bist is a title used in communities living primarily in the Central Himalayas, Indian state of Uttarakhand. Bishts are on most occasions Jajmaans/Rajput and sometimes Brahmins. It was a title generally given to the chief of army or a war-lord. 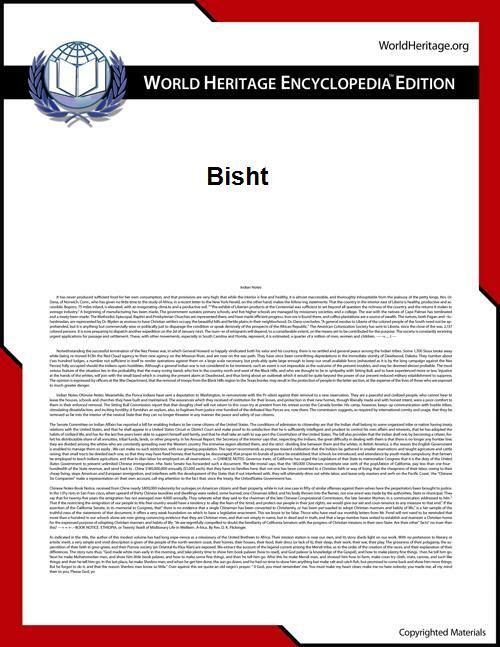 Bisht/Bist was a title given by kings to nobles, derived from the Sanskrit vishisht ("distinguished"). BISHT surname belongs to Jajmaan/Rajput community of Uttarakhand, both in Kumaon and Garhwal. But you also find some Brahmin sects in Uttarakhand (Garhwal/Kumaun) using the title Bisht. In Himachal Pradesh (Rampur Bushahr) however the title Bisht is used by Wazirs of Rampur Bushahr who originated from Garwhal . In himalayas both the Rajput and Brahmins are found, however the Rajput are major. Bisht surname is also seen by many as a derivative of 'vishisht' meaning distinguished, not confusing with the 'vashisht' which is again a Brahmin gotra. Some Bisht title people may have royal lineage.They were also Raja's or Kings,but on some occasions it refers to the title given to nobles (Jajmaans or Brahmins) by the kings. They were Chieftens(Grahadhipati) of some "Garhs" of Kumaun and Garhwal. While Brahmin-Bishts commonly went back to using their Garhwali-Pandit Clan-name or honorary title, the Jajmaan-Bishts continued using this title while keeping a record of their original castes which with the passage of time are now considered different sects of Bisht Caste/Group. Brahmin with Bisht surname/title are more common in Kumaun region. Being a title of status, Bisht became obsolete with land reforms, but many families still remember the origin of their last names or surnames. Sects under Bisht are based on their original titles or on the name of the villages of origin. Some of these sects are common with other caste/title of Jajmaans. Salam Bisht(Chaana Gaon Salam Patti) Jeena Bisht, Shyotari Bisht, Sunari Bisht, Kafola Bisht, Thayat Bisht, Chamoli Bisht, Shyotari Bisht, Edwal Bisht, Bakhwal Bisht, GAIRA Bisht Parihar Bisht, Pundir Bisht, Rawal Bisht, Rana Bisht, Mehar Bisht, Khadeti Bisht, Khanai Bisht, Basanwal Bisht, Newal Bisht, Chamial Bisht, Knayu Bisht Nainwal Bisht, Dhaira Bisht, Heet Bisht ('Raja Har Singh Heet Bisht' HARU HEET also known 'BHUMIA Devta' was famous ruler of Gujru Patti or Gujrukot), Timali Bisht, Bhamoora Bisht etc. Uttar Pradesh District Gazetteers 1959:Naihfgnital. Uttaranchal: Historical and cultural perspectives, Uma Prasad Thapliyal.